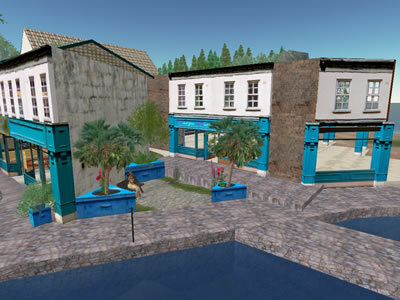 Last week end i started to think of how to set out a garden in the triangle between what will be the new shopping mall on Cosy Cove. I had some idea what i wanted, triangular planters, a bench, some plants, maybe flowers and a sense of peace. 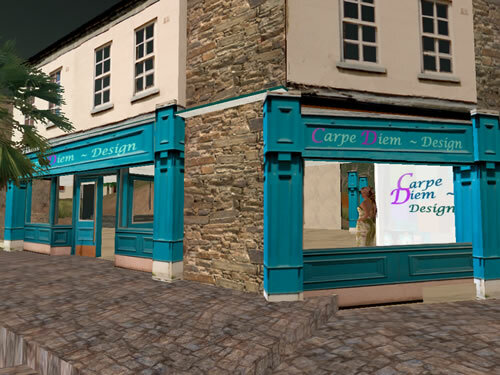 I quickly realised that the entrance to my new ‘Carpe Diem Design’ shop should be on the telehub side of the mall, so people can enter Cosy Mall from the beach and from the garden entrance of ‘Carpe Diem Design’. I had several attempts at working out the planters but could not get the triangular ones I really wanted to make until Geoff came online on Monday and with his help we made 3 lovely planters with palmtrees and flowers. Two benches (might change them) are ready for weary shoppers or just people who want to enjoy our cosy harbour. 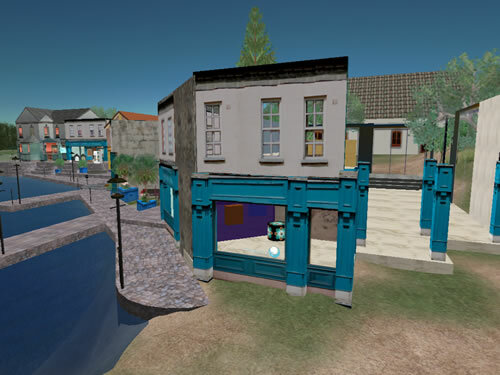 Ravenna Eponym who is a newbie (under 3 months in Second Life) and already producing beautifull art needs a shop to show & sell her creations; she now rents the ideal place for a mini-shop in ‘Cosy Mall’ right beside the path and opposite her home and workshop on Cosy Home the first sim of the Cosy Islands. Excellent logo and the best of luck to all the people who will exhibit in ‘Cosy Mall’ and also to Syl Normandy who bought what used to be Van’s art gallery: ‘The Flying Peach’. 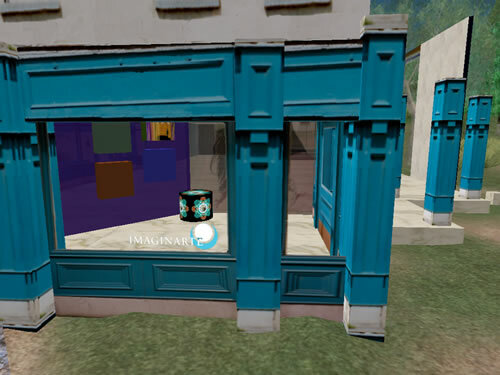 And here it is the entrance to the new ‘Carpe Diem Design’ where i will sell houses, shops, doors of various types, privacy windows, carpets, baths, arches with seats, etc possibly a few freebies like T-shirts with a promotional logo. Geoff looked after the first floor and has been shaping it around the top. The other side of the shop has a totally different architecture….till next blog on Cosy developments!